Grace’s involvement with the FWCC changed her life and ours, and I cannot imagine that her education would have been complete without the influence of this organization. My daughter began her involvement with the choir in early elementary school. During that time, she developed exceptional musical skills, an amazing ear for singing harmony, and a tremendous ability to sight-read music. The musical skills learned there have manifested themselves far beyond the FWCC. They enabled her to be a leader in her own school’s choirs and ensembles, to have a Worship-Leader role in our church, to advance more quickly in her own private music lessons, and are apparent in her own singing and songwriting endeavors. She has developed a warm, yet confident, stage presence that began on the FWCC risers as a member of the Apprentice Choir. In addition, the FWCC has given Grace the opportunity to work with a variety of gifted clinicians and to meet a variety of kids from many other regions and organizations. It has provided a wealth of cultural experiences too numerous to list and has given her the opportunity to travel, both domestically and internationally. These travel opportunities have allowed her a degree of independence, while still being in a safeguarded environment. The friendships she developed through the choir have been a tremendous addition to Grace’s life. The choir has given her an identity far beyond the walls of her own school. As a mother, I especially appreciate this aspect. 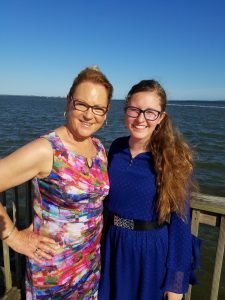 As she moved from early elementary school to middle school and high school, and began to experience the additional drama that always seems to manifest itself at this age, the FWCC not only provided a refuge for her, but it also served to protect her from much adolescent angst and isolation. Because of the FWCC, she didn’t have all her eggs in one basket socially. Grace could navigate the halls of her school much more confidently, because her acquaintances and friendships went beyond the walls of her school. It gave her a confidence and a resilience that I know I didn’t have at that vulnerable age. Grace is now in college and she has had many opportunities and even scholarship awards that can be traced directly to her involvement with the Fort Wayne Children’s Choir. The organization has offered her a stage to perform, opportunities for leadership, and the ability to demonstrate long-term commitment to an organization. It’s been our experience that these are qualities that colleges and universities are looking for. We can’t imagine that as many doors would have opened for her without her involvement in the FWCC. We will always be grateful for the opportunities provided to our daughter through this organization and for the countless individuals who give of their time and talent to make the Fort Wayne Children’s Choir what it is today. Grace’s experience is like many others from the FWCC – the story of music and the positive impact in the lives of our singers.